In an attempt to reduce the amount of kitchen waste my family produces, I've done a good deal of research and put in place several of my findings. In the off chance that your family also struggles with food waste, these 17 tips on How to Keep Produce Fresh Longer may come in handy for you too! So, a ‘friend' posted this struggle. She goes to the grocery store and loads her cart with bright red, fresh strawberries because she just knows that today will be the day that her teenage son actually wants a handful of strawberries afterschool instead of stopping on the way home from school for a bag of Doritos. OR…she fills her shopping cart with a rainbow of brilliantly colored vegetables for the hearty and healthy salads they will be eating for several meals this week, only to find that they have several showings scheduled and so end up grabbing pizza instead. As much as I do appreciate the benefits of compost and building my compost pile, I'd rather it be my strawberry caps and leaves that get composted and not the entire strawberry! Can I get an ‘AMEN'? I don't know if this fact will make my friend feel any better, but she is not alone. Sadly, the average American family tosses 25% of their groceries into the trash…yikes! If your ‘friend' has the same struggles with keeping food fresher longer, I've gathered a few tips on how to keep produce fresh that you can share with her. 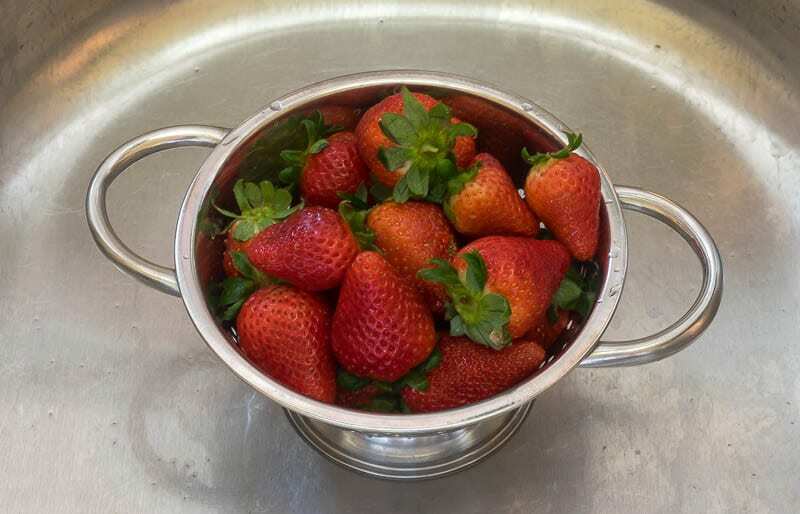 Give your Strawberries, Blueberries, Raspberries, Blackberries a vinegar bath. The vinegar kills any bacteria spores that could be on the fruit, thereby reducing the opportunity for the mold spores to multiply. I use a ratio of 1 part vinegar to 3 parts water. 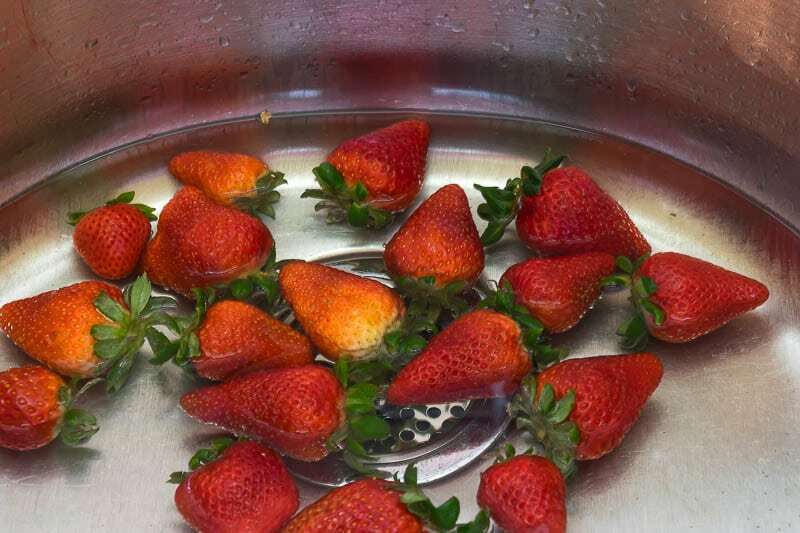 Once the fruits have had their vinegar bath, I remove them to a colander or towel or salad spinner to make sure they are completely dry before I store them in the fridge. I also use a berry storage container which maintains an appropriate level of oxygen and carbon dioxide and has a vented tray that prevents the berries from sitting in moisture. Store your apples away from other fruits and veggies as apples give off ethylene gas. EXCEPT for your potatoes…storing an apple with your potatoes can prevent eyes sprouting for up to 8 weeks! In researching how to keep produce fresh longer, I did a deep dive into ethylene gas. Since ethylene gas, a natural by-product of the ripening mechanism of most fruit and many vegetables can speed up the ripening (and therefore decaying) process of other fruit and veggies, an ethylene gas absorber in your produce bins is a great way to reduce that decaying process. Don't store your onions and potatoes together…they each release gases and moisture which are detrimental to the other. Wrap mushrooms in paper towels before storing. Don't separate your bananas, but do wrap their stem in plastic wrap. Let avocados ripen at room temperature (putting them in a bag with your bananas will speed up that process) but once ripe, store them in your refrigerator. If you buy your leafy greens in a plastic tub, take the greens out of the tub, wrap them loosely in a paper towel and then return them to the plastic tub. The paper towel will absorb any unwanted moisture. Store your lemons and limes in a container of water in your refrigerator. Parsley and Cilantro will hang around longer if you trim their stems, place them in a jar of water, cover them loosely with a plastic bag and place them in the refrigerator. Change the water as needed. I was gifted with this herb saver several years ago and have had great success with it as well. For basil, do the same but skip the bag and refrigerator. Basil does best at room temperature. This principle also helps extend the life of asparagus and scallions. Trim the ends of the asparagus, but leave the roots on your scallions. You can keep your scallions on your counter if you chose, but if you want to pop them in the fridge then cover them lightly with a plastic bag. Change the water as needed. To further extend the life of my fruit and veggies, I have lined my refrigerator produce bins with these inexpensive and lightweight foam liners which absorb moisture and odor and encourage air circulation. Are your refrigerator and freezer at the right temp? The FDA recommends 40º for your refrigerator to keep food fresh longer. If in doubt, an inexpensive Refrigerator/Freezer Thermometer can come in handy. Because we all remember from our middle school science class that heat rises, the top shelf of the fridge is the warmest part of the fridge. Soooo, it goes to reason that the bottom shelves are the coolest. Here's a handy Food Storage Chart which details what to store where and which fruits put off high levels of ethylene gas. What are some of your tips for How to Keep Produce Fresh? And if you want to refer back to these tips on How to Keep Produce Fresh, then bookmark this page or pin the following image. Love these tips. I have been struggling with scallions going bad so I’ll try the tips for those. I also never thought about wrapping mushrooms in paper towels so I’ll try that. I haven’t had problems with my lemons & limes going bad but I’ll try the water to see if they stay more fresh. We eat salad pretty much every day…sometimes more than once a day so we go through a lot of produce. The only other tip I can think of has to do with meal planning. I go through my fridge at least once a week, sometimes twice & mentally list the foods that need to be eaten within a day or so. Then I plan meals around those foods. If I just can’t get them into meals I try to freeze them for cooking in the future. I think it just takes practice to prevent food waste starting with buying only what you’ll eat to being willing to get creative with leftovers. Love this post & the new ideas. Meal planning is key! I used to be very good at it, then fell off of the wagon, and now I’m better at it. I am so glad you will use some of the tips…always happy to help my friends save a few $$$$. I have a tip for celery: when you bring it home, wrap it ina dampened paper towel, then wrap it in aluminum foil. It will keep fresh for a couple of weeks! Really? I need to give that one a try Lesley! Thanks for the suggestion my friend. You are so very welcome Sherry! I am always trying to find out newer/better ways to do things and love sharing them with my fantastic readers! Thanks for taking the time to send in your kind comments. I love these tips! There are some really good ideas I never heard of and I can’t wait to implement them. My berries always get mushy too quickly so I’m definitely going to try the vinegar bath. I’m also going to look into the foam liners for the the fruit and veggies drawers. Thank you for sharing! Thanks so much for coming by and leaving your kind comment. I have been doing the ‘vinegar’ tip for years and I really do believe that it extends their life. Just make sure they are good and dry before you refrigerate them. Hope all these tips help!